Among the items that got Gov. Larry Hogan’s attention at his second Board of Public Works meeting Wednesday was a $90,000 contract to search for a new chief investment officer (CIO) at the State Retirement and Pension System. Sitting next to the governor, State Treasurer Nancy Kopp and Comptroller Peter Franchot, chair and vice-chair of the system’s board, gladly deflected the governor’s scorn and turned it over to Dean Kenderdine, executive director of the State Retirement Agency. “It is a contract that was competitively bid and is a fee structure that is typical of this industry.” said Kenderdine. The fees are based upon a percentage of the CIO’s final salary, which is a range of $200,000 to $300,000 established by the Board of Trustees, headed by Kopp and Franchot. The search firm chosen, accepted a bid at 30% of the CIO’s final salary. Its fee was also the lowest of the four firms interviewed. “Well in terms of state government I would agree, but this is the Board of Trustees overseeing a $45 billion investment program, which is highly complex and requires a high degree of skill,” said Kenderdine. “If we get a bad CIO it is a huge negative for our beneficiaries and frankly our taxpayers who will have to fill up the difference,” Franchot said. Franchot is concerned on the state of the pension fund and urged the governor to stick to his funding of it in his budget. “The problem over the years has been well intentioned on the legislators’ part, but chronic annual dipping into the pension contribution and underfunding what is our obligation to our public employees,” Franchot said. Kopp doesn’t believe past decisions were meant to purposely underfund the pension programs, but she agreed with the comptroller. Maryland is recovering from a horrible recession, and Kopp said she hopes the new CIO will help the state to continue the climb out of it. 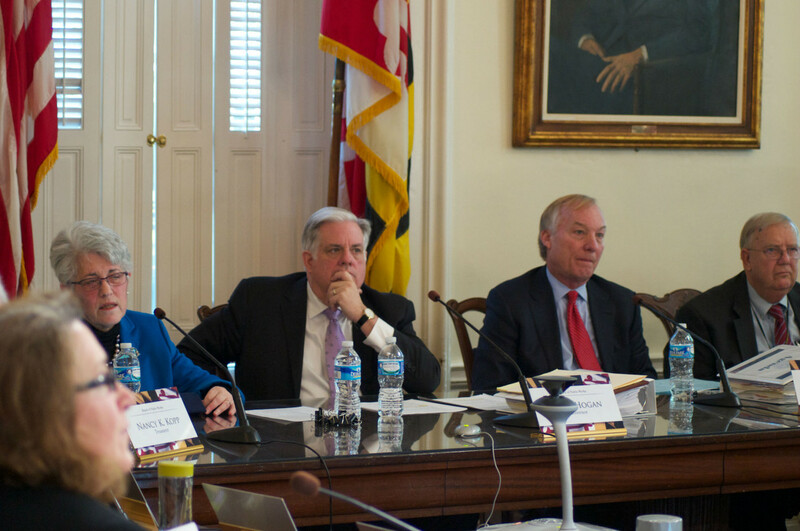 Hogan and Kopp agreed and the new governor seemed to know that he was the odd man out on the $90,000 proposal. “I agree that we need the best we can find in the country and I hope that it is money well spent.” Hogan said. The $90,000 was approved unanimously. This Friday, the search firm will present 14 qualified finalists to the agency search committee, who are expected to reach a decision by the time the legislature adjourns.